Don't miss a great shot because your camera's battery runs out of juice. 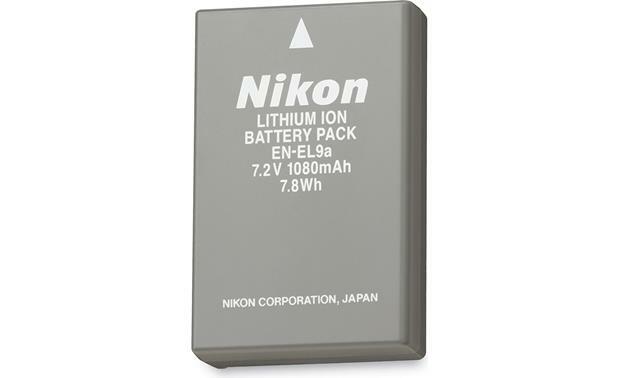 Carry a spare EN-EL9A battery so you can keep shooting with your compatible Nikon digital SLR. Great battery for my Nikon D5000. Charging Information: The EN-EL9a can be charged using the Nikon MH-23 Quick Charger (054MH23). It takes approximately 1 hour 40 minutes to fully charge a depleted battery. Battery Life: When used with the Nikon D5000 SLR digital camera the Nikon EN-EL9a can last up to approximately 510 shots in single-frame mode or up to 2,900 shots in continuous mode depending on operating conditions. Weight: The battery weighs 1.8 ounces. Searches related to the Nikon EN-EL9A Battery Rechargeable lithium ion battery for select Nikon digital SLRs.